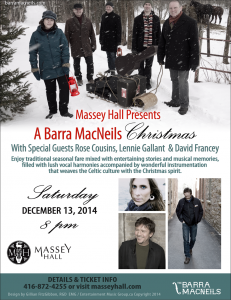 The music, memories and magic that is the Barra MacNeils will be coming to Massey Hall on December 13, 2014 – one show only at 8 pm. 2014 marks over 27 years for the Cape Breton Island based family group, the Barra MacNeils, in an outstanding recording and touring career. This holiday season they are celebrating again with their yearly Christmas tour that takes them from the Pacific West to the Atlantic East coast. It all begins in British Columbia, taking in some dates in Ontario,then to the Atlantic East Coast to P.E.I.,New Brunswick and wrapping it up December 21st in Nova Scotia. As a group, the MacNeil siblings are widely regarded as one of the greatest live concert acts in the Celtic world. 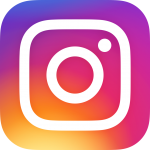 The family group is deeply rooted in Celtic music, culture, dance, language and history. Their numerous critically acclaimed recordings have included their own original songs as well as tried and true standards, both instrumental and vocal. A live concert experience with the Barra MacNeils is like no other with multiple lead vocalists, beautiful sibling harmonies, top drawer instrumental prowess on a wide variety of acoustic, stringed, percussion and wind instruments blended with dancing, storytelling, Gaelic songs and a journey through an ancient culture; it is family entertainment at its highest level. Steeped in Cape Breton history with strong Celtic roots and musical artistry, this diverse and talented family group continues to entertain audiences around the world with their captivating vocals, harmonies and extraordinary musicianship. The Massey Hall show also will feature Rose Cousins, David Francey and Lennie Gallant, all adding to the traditions of a ceilidh Christmas gathering in a concert setting.